The use of bound grit wheel in the flathoning technique results in metal-cutting machining entailing burrs on the work pieces. For specific deburring as a succeeding operation, a deburring machine equipped with a turning device for two sided deburring is appropriate. 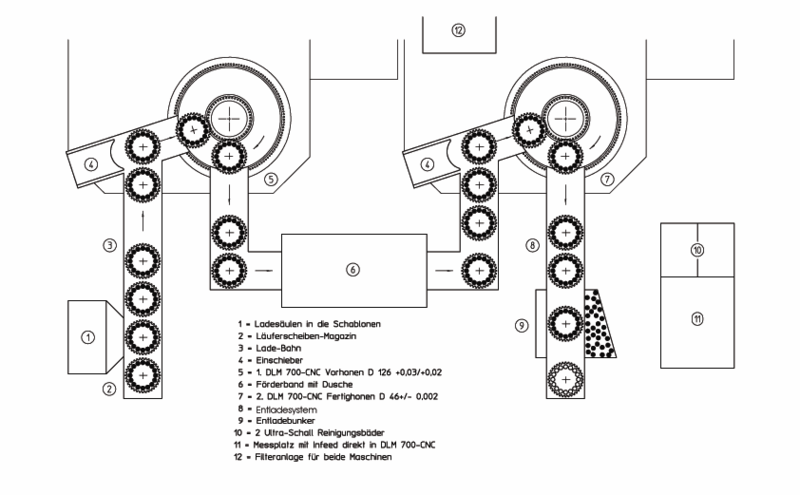 A direct transfer after the flathoning process is efficiently solved with Stähli machines. The request to interlink the two wheel flathoning process with the one wheel polishing process was successfully realized with Stähli machines thanks to developing the automation of one wheel polishing machines back in the year 2000. The interlinking of 2 two wheel flathoning machines with intermediate cleaning to prevent the spreading of the grit is represented in picture 8.